Extra-large, wild-caught Cod fillets in a crispy beer batter. 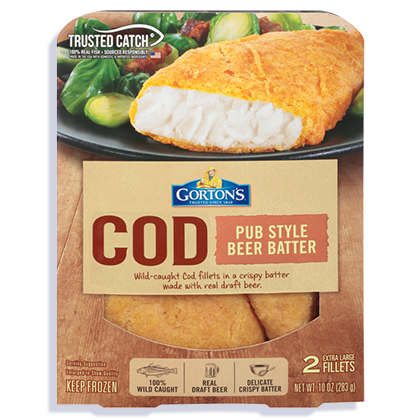 Transport your tastebuds to the taverns of yore with our Pub-Style Beer Batter Cod. Cooked in a crispy batter made with real draft beer for a hearty pub taste, these extra-large fillets are the perfect answer to an empty stomach. 3. Bake and flip after 20 minutes. Bake for 30-35 minutes*. INGREDIENTS: Cod fillets, batter coating, canola oil. Wheat flour, beer (water, barley malt, corn, rice, hops, yeast), water, baking powder (sodium aluminum phosphate, baking soda), salt, sugar, palm oil, colored with paprika and turmeric extracts, whey.